Activist for Harmony ... Budding Author ... Writing is my therapy. "any magical power or process of transmuting a common substance, usually of little value, into a substance of great value." Mmmmm that reminds me of what my mom can do with a cheap cut of beef ... oh the taste of that stew is unarguably of greater value than the contents therein. Value is relative though isn't it? What is valuable to me, isn't always what's valuable to you. So by now the net is overflowing with articles about Dabbing. I'm sure by now we all know how Cannabis concentrate is made. And there are many different ways. This isn't another one of those articles. Discussions turn to debates turn to digital battles of wits. No one can agree on the perfect method, the perfect solvent, or the perfect purge. But for readers not 'in the know', Cannabis is now converted into a very concentrated form that is basically different consistencies of Oil. A broad term is a Dab, but these can also be called BHO (butane honey oil), Wax, Ear Wax, Oil, Shatter, 710, Budder, Honeycomb, and some I'm not even aware of I'm sure. Also to be clear, dabs are usually smoked in what's called a 'Rig' or a bong with an attachment of a small heat conductive cup that's heated with a blow torch. The concentrate is then dabbed into the red hot cup. Smoke is slowly inhaled. There are many benefits to using dabs. This isn't an article about those either. This post is about something called re-claim. What the heck is that and more importantly, have you been dumping it down the sink each time you clean your equipment? I hope not, but it's quite possible. I fear that half of the people enjoying dabs are throwing out the 'savings account' and medicinal compound known as re-claim. So what is it? When you do a dab, some of the oil does the 'escape-by-sizzle', jumps outta the cup and ends up in the water-line of your rig or bong. Also, some of the oil is within the smoke and sticks to the glass as the smoke lingers. To the untrained eye, it looks like a BP oil spill just polluting your bong water. But it's nothing short of medicine. Like the bottom tray of your trusty grinder holding the trichome dust, this scummy looking oil is your best friend when you're out. Or, as my buddy found out, as good a sedative as he has tried. Not that he's tried much, being a tree-hugger. All he knows is, he put some of it into a caplet and an hour later he was ready for night-night. He slept nine hours straight. And dozed pain-free for a few more. 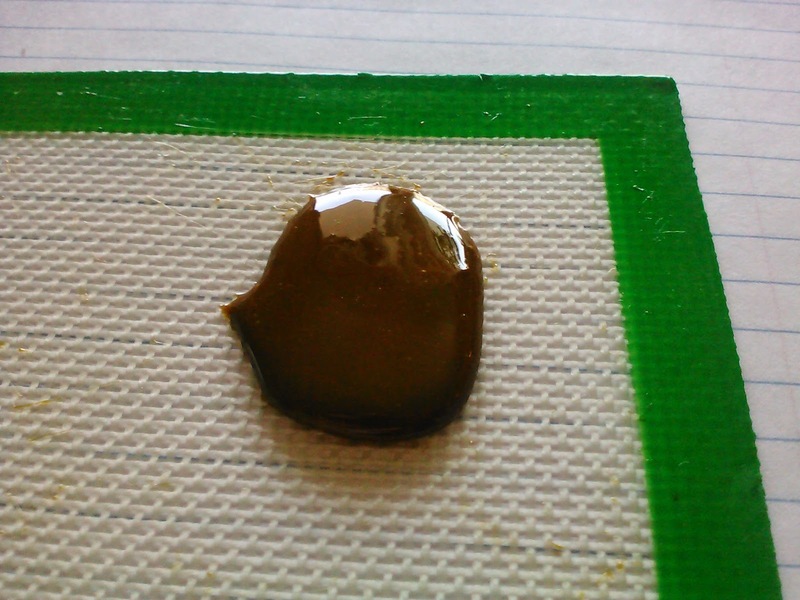 My buddy makes his own Dabs. He uses a vacuum pump to purify it of all impurities. His system creates some of the purest concentrate around. It's smoke often smells like wind*x. The other day I was lucky enough to witness this savings account collection for myself. And pics were taken. The most important thing to remember when working with a glass rig or bong, is that metal and glass never mix. No matter how steady you think your hand is. Wooden shish-kabob sticks work perfectly though. Their wooden texture helps the re-claim to stick to it. Because of the consistency, once some oil touches the stick, you can literally flick it around collecting wads of this stuff like taffy. 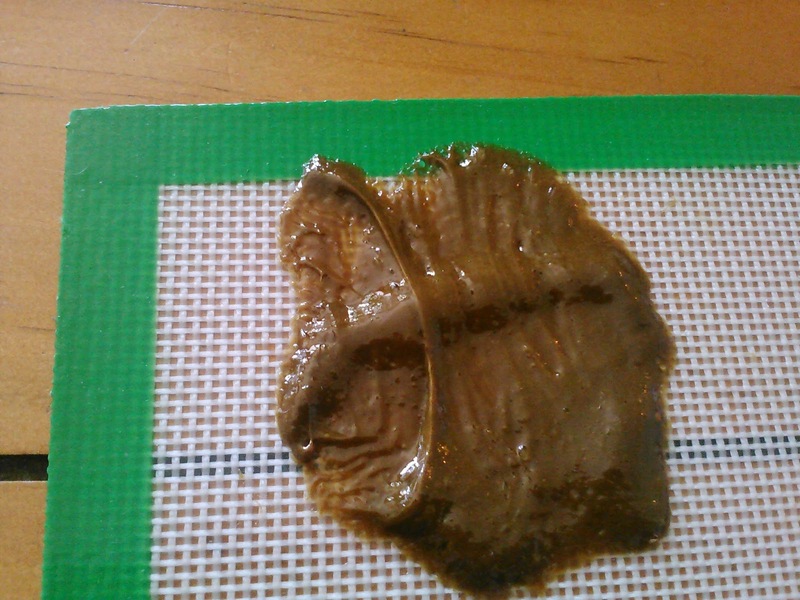 When a glob gets a certain size, he'd pull the stick out and collect it on parchment paper or this little silicone mat that looks like something from the Star Trek and totally unnatural and processed. But it's not! Silicone is the newest shizzle. It truly is a ridiculously amazing product that's surprisingly natural. In fact, Silicon makes up almost 28% of the Earth's crust and has been safely used for years in consumer products. I always thought it was some kind of super sci-fi product, but once you use it you'll see it's superiority to parchment paper. Get yourself one of these mats when you collect your re-claim. Just look at the pics. 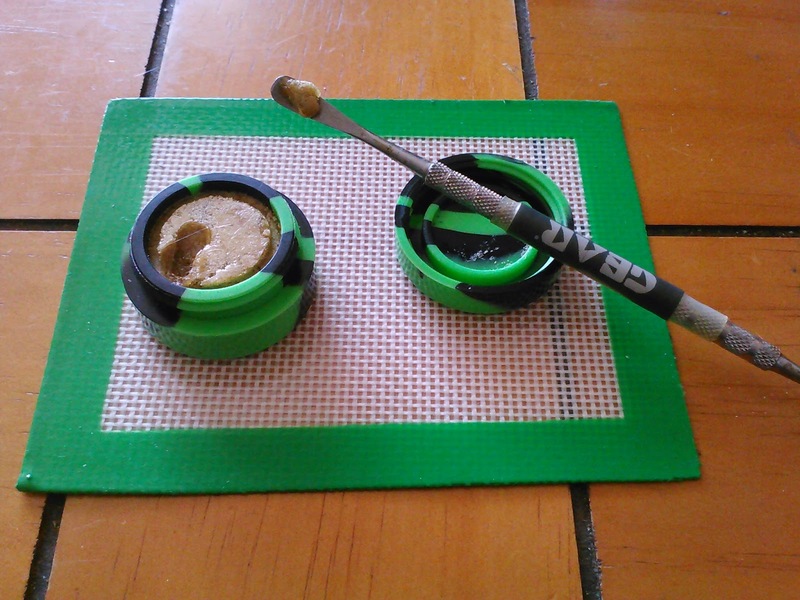 You can also get little Silicone tubs to store your Dabs in. By the time the collection was complete, there was literally nothing on the walls of the bong and only slightly cloudy water. Ready for a good cleaning. Where's the Or@nge Chronic? PIC 1: you can set the mat on it's side in order to collect the excess water. Using the edge of a clean tissue you can absorb any puddles. PIC 2: within no time of working this back and forth, buddy has it in a glob. More water is absorbed with a tissue. PIC 3: ready for purging .... looks like a shiny piece of taffy that slowly becomes liquid again when left for long. Now what the heck do you do with this stuff? It's a very sticky product reminiscent of Pine Tar or tree sap. Buddy worked it around on that Silicone mat for a while, squishing it and then balling it up again. Working out any remaining water. Then he put it in his vacuum purge device. That's a whole other post though, we won't get into that. 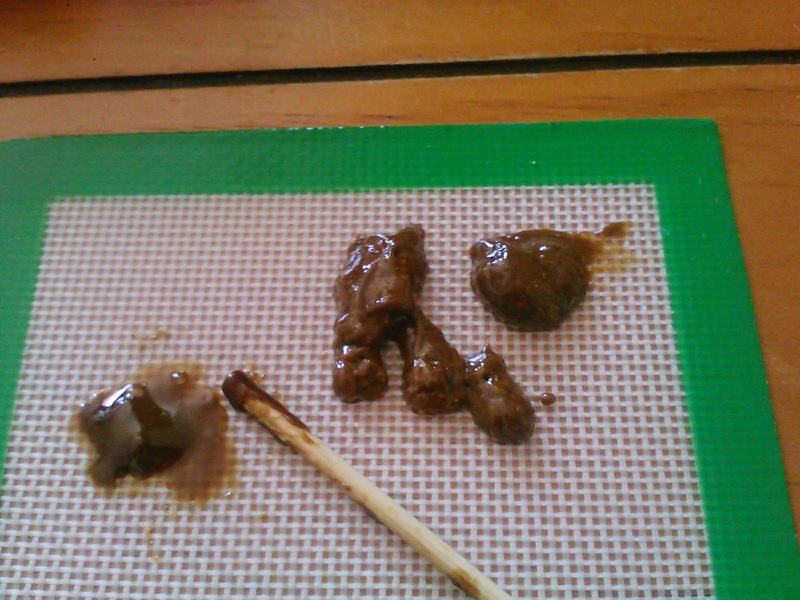 I will say though, that another way to 'purge' cannabis concentrates is in gently bubbling water, so there wouldn't really be any more chemical remnants in your Re-claim than there would be in your Dab to begin with. So what to do with your Re-claim is really up to you and your personal ingestion of choice. Smoke doobs? Spread some of this Oil on your paper! Smoke bongs? Repeat the above, and add it to your bowl for a Rocket! Don't smoke? Get yourself some gelatin caplets from the health food store and ingest it orally! It can also be added to Cannabis Oil infusions to ramp up the Cannabinoid content. You could then bake some edibles or savoury yummies using that oil. So ... as you can see, Re-claim is nothing short of free wonderment in a gooey looking mess. And should NEVER be sent down the drain!! Whole Plant Cannabis Oil ... A Kid's Best Friend?